We were free diving on a small sailboat wreck reportedly dating from the 1800's a few miles north of of North Bimini in the Western Bahamas yesterday. What should Dr. Denis, a Marine Biologist, see but a Pacific Red Lionfish, likely Pterois volitans. Denis and I grew up diving in Ft. Lauderdale. It was a shocker to me having grown up seeing delicate images of Lionfish with the understanding that they were Pacific fish and never occurred in Atlantic waters. Denis had heard of other sightings in the Biminis in recently. I did a little searching and found out that the Red Lionfish has been sighted up and down the east coast of the USA including Florida as well as in various islands in the Western Bahamas. The Lionfish usually are found only in the Pacific and Indian Oceans. 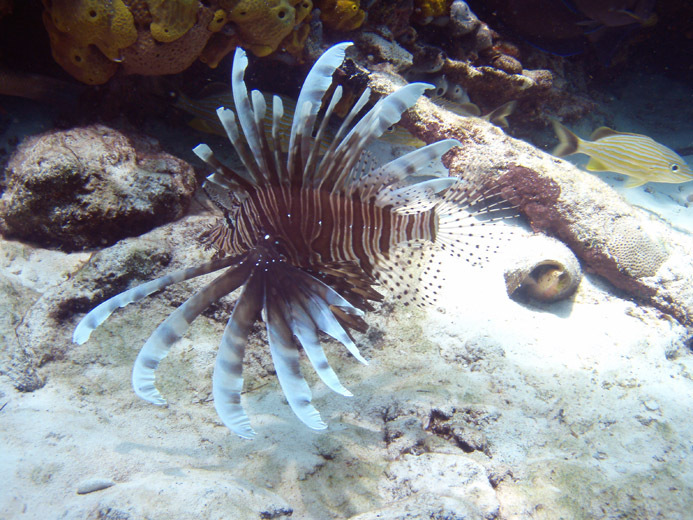 The video clip of lionfish in Bimini and Andros appears on Vimeo appears below. I think the compression there results in clearer clips than on youtube. The same clip of poorer image quality on youtube appears below. It is interesting what manual compression & processing will do for you. I wasn't trying to disturb it unduly despite appearances. Not being aware at the time of the degree of documentation already in place about the appearance of this species in foreign waters I made a point of showing off native species and biotope characteristics in the photo background. Not in the Pacific. 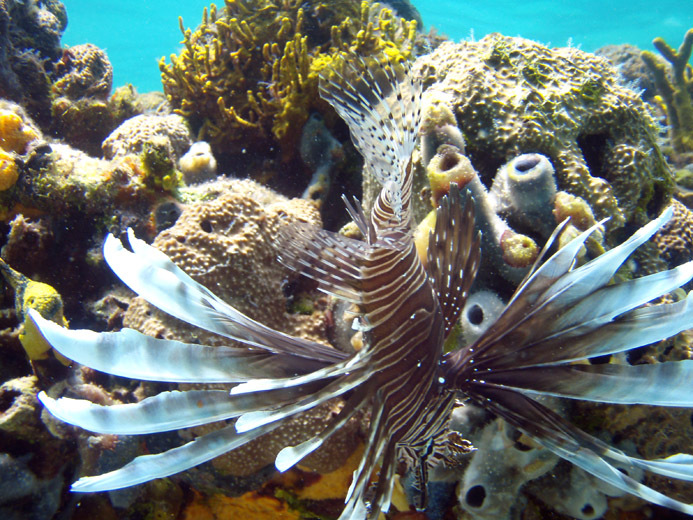 Lionfish congregate at times in their natural ranges. I don't know if this behavior has been observed in the Atlantic yet or not. 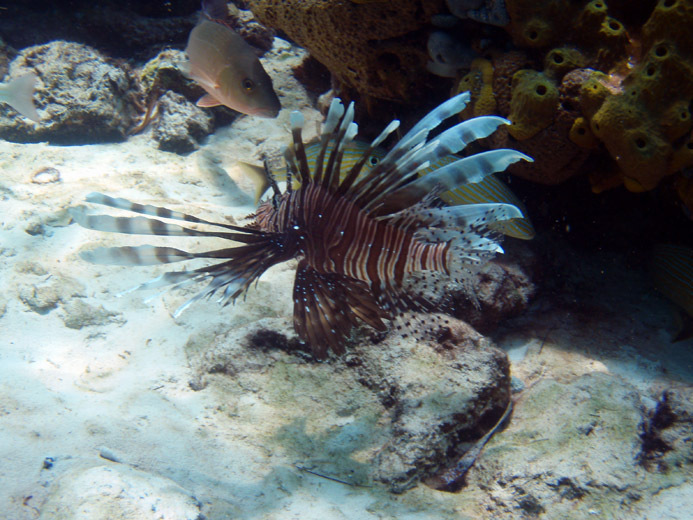 Young lionfish have been seen going back years in this area suggesting that populations are reproducing. 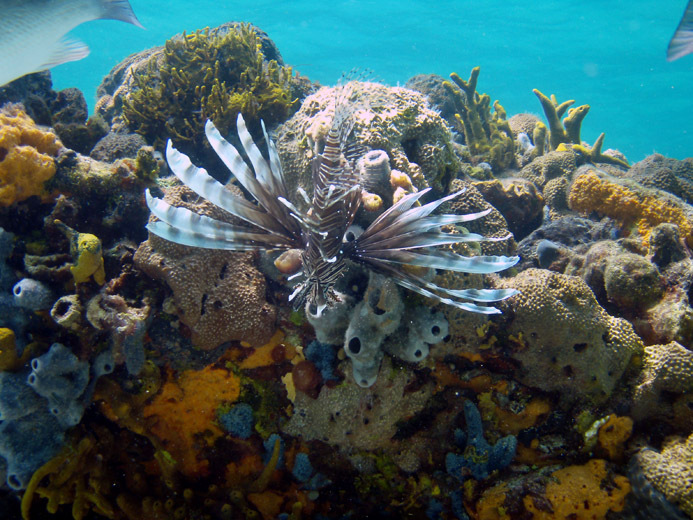 Some are aggressively harvesting (spearing) lionfish when found in Atantic waters in an effort to try to reduce potential ecological damage from this invasive species. 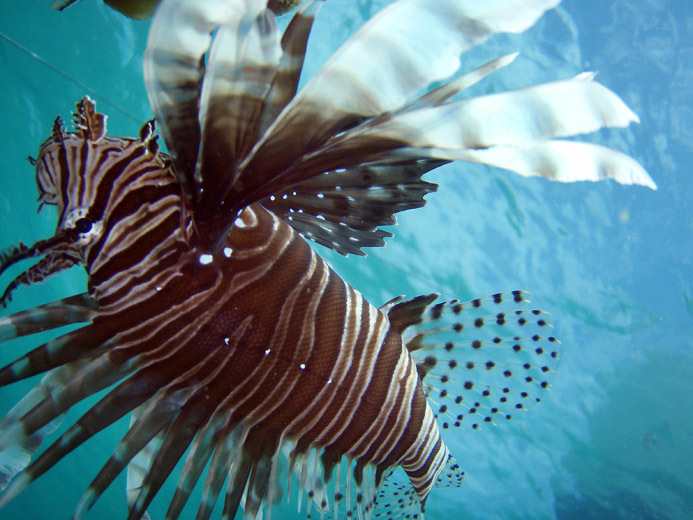 It is possible that the lionfish has no predators in the Atlantic unlike in its home waters. It could do a lot of damage, largely unpredictable at this point. Shooting them may make sense. Get used to the sight and prepare to intercede with caution with these guys unless word to the contrary comes out. Take comfort in this parting point, only about 140,000 pythons have been brought into the USA. Who knows how many have been released into the "wild." Man's stupidity and indifference at times can be overwhelming. Last edited by RickI; 06-22-2008 at 05:54 PM. That lionfish use to be in someone's fish tank, right? Hey Rick, there was an article in a spear magazine a while back, calling for spear fisherman to shot them anytime they saw them up and down the east coast and they gave areas. They destoy the fish population, nasty little things, and they are not fromthe waters, but adapt very easy. I will look for the article to send you. Have fun! Damn is it hot here, where is the wind? Probably not. Doing a rapid search of the literature online, lionfish have been sighted at least 7 years back along the east coast of the USA. One account had it that one was seen off Honduras 20 years ago. It is reasonable to conclude that the invading populations have become established here. Its distant ancestors may have been in someone's fish tank however. Welcome to the neighborhood. That is what Denis said and did. I am amazed at how fast they have apparently spread. It would be good to see the article if you can find it. Are you still in Peru? Must not be and yes it is really hot! If you have seen any please help NOAA to better understand what is going on with the invasion. Last edited by RickI; 08-01-2007 at 06:44 AM. I have to claim ignorance as a young guy on the idea of exotics and competition with native species. Back when I was in high school I had a salt water fish tank. When things in it got too big for my tank I released some to the Gulf. The fish stores wouldn't take them back, so I released of couple of exotic moray eels to the Gulf by a huge rock formation near DeSoto fishing pier (we called them snowflake eels) as well as panther grouper. I included a pic. Do you ever see any of those while diving? SO many people buy those panther groupers when they are small, then they grow really fast and eat everything, that I can't be the only one to have released one. I wonder if they have established populations in some areas. Hard to believe some exotics are introduced on purpose by agencies for one reason or another and of course you know about larval inverts and ship ballast water. Last edited by Skyway Scott; 01-02-2008 at 03:44 PM. Haven't seen the eel before but quite a few soapfish similar to what is in the photo. Haven't heard of Panther Groupers before though. Tons of exotics have been introduced all over the place worldwide for a long time. Some don't make it, some cope while still others take over. It sounds like the lionfish may be well entrenched already. Was just talking to someone over on North Andros, he said they had lionfish, enough to make it the national Bahamian fish. Noticed the image below on a site from the Exuma's. I haven't seen anything in the literature yet that indicates the invasion is as widespread as this. Looks like the lionfish may be here to stay at this point, warts and all. Have difficulty believing all this came from six fish that might have survived a 15 ft. plus storm surge that bashed through a house in Miami 15 years ago. Yeah. 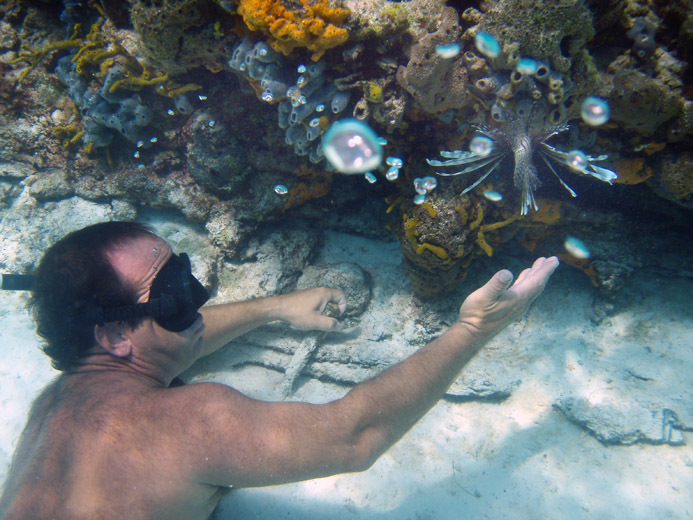 I am sure that thousands of people have released lionfish from their home aquariums. "Panther grouper" is actually the pet store name for the fish in the photo. It is indeed a type of soapfish. It loses its spots and looks rather dull as an adult. actually most of these fish likly came from the ballast tanks from in bound freighters. This is also the case for damaging plant life as well. The large freighters generally carry around 1 million - 5 million gallons of water used as ballast. There are ships that actally carrry up to 20 million gallons! This water is taken on very near to any port that they depart from. I know that SF Bay is suffering from some sort of weed that was imported this way and it has no growth control. I'll pop a lyon fish or two if i see them!